This Heatmor outdoor boiler review provides buyer information about the brand’s furnace lines and models. We include details about features, performance and Heatmor furnace cost. Heatmor began making this brand of furnaces in 1990 in Minnesota, where its 40,000 square foot manufacturing facility is located. By the way, if outdoor furnaces are new to you, our Outdoor Wood Boilers and Furnaces Guide has complete information. Explore how the units heat your home using either a hydronic/radiant heat system or a forced air system. We’ve added details about high-efficiency wood furnaces, options and features and outdoor wood boiler cost. Heatmor makes one series of furnaces that meet the 2015 EPA regulations for residential use. You can learn more about the regulations for wood burning appliances here. The Heatmor X Series (X-Series) has two models approved by the EPA. A table showing their features can be found below. We also give brief overviews Heatmor coal burning, dual fuel and commercial series, though not in detail. The coal burning furnaces can also burn wood, though that isn’t legal in all states. The X-Series is the focus of this review. First, let’s clear up a common point of confusion. These are boilers. The term “furnace” is used in the literature to describe both boiler and forced air wood burners. A boiler system heats water in the outdoor unit. Forced air systems heat air that is pushed into your home’s ducts. Outdoor boilers are popular for their versatility and low heating costs. More on costs later. As for versatility, the hot water produced by a Heatmor furnace can be used in several ways. It is circulated into your home through buried supply and return lines. Using the appropriate heat exchanger type, the heat from the water can be transferred into an indoor boiler system (water-to-water heat exchange) or a forced air furnace system (water-to-air exchange). The heat can heat your domestic hot water in addition to heating your home. Just be sure the unit you choose has the heating capacity for both purposes. Note: The water from the boiler isn’t mixed with indoor boiler water or water in a hot water tank. It is transferred through a heat exchanger. This video shows how the most common type, a plate exchanger, is installed and works. Burning wood produces highly corrosive acidic moisture as a byproduct. Heatmor combats corrosion with stainless steel. The brand’s signature feature is a 409 stainless steel firebox (10 gauge), water jacket (10 gauge), base (14 gauge), door interior and flue. The non-corrosive nature of the material significantly extends the life of the furnace. Stainless steel raises the cost, but your furnace might last two to three times longer than those constructed from mild steel. In the long run, that’s good value. The Heatmor warranty is one of the best in the industry. Most outdoor wood boilers (OWBs) have 20-year prorated warranties. The Heatmor lifetime warranty covers defects in materials and workmanship, which are standard for a warranty of any length. However, Heatmor takes it a step further and includes corrosion – a lifetime warranty against corrosion. The lifetime warranty covers all stainless steel parts. The warranty is 100% for the first five years. It is then prorated in years 6 to 20. After 20 years, the warranty is 10% for the life of the furnace. If parts covered by the lifetime warranty fail in the first five years, it is Heatmor’s custom to provide you with a completely new furnace rather than repair the existing model. When furnaces fail later, Heatmor typically offers the customer a large discount on the purchase of a new Heatmor furnace. Parts such as the aqua-stat and bladder are not manufactured by Heatmor. They are covered with a 1-year warranty, standard for the industry. Like all warranties, there are exclusions, so read the Heatmor furnace warranty carefully before choosing a Heatmor or any brand. The two furnaces in the X-Series line have large capacities. The 200,000 BTU 200 X heats 2,500 square feet if loaded once a day and 5,000 square feet if loaded twice. The 280,000 BTU 350 X heats 4,000 or 8,000 square feet. The heating capacity is slightly less if you are also heating your home’s hot water. In addition, the amount of heat each furnace makes can be controlled by how much air the fire receives. Gasification boilers, or gasifiers, are more complex and are outfitted with additional equipment. The technology produces downdraft and oxygen infusion to burn the gas vapors (smoke) inside the furnace with secondary combustion. This makes them highly efficient, so they use up to 50% less wood than some standard boilers. However, Heatmor claims that its combustion system burns most of the smoke vapor, creating more heat and less waste, without additional costly equipment. The efficiency is achieved in several ways. An over/under draft system gets oxygen to where the fire needs to be. The airflow design and high-efficiency flue naturally produce some secondary combustion. The flue has a larger surface area to enhance heat transfer into the water before combustion gases leave the furnace. Our conclusion is that Heatmor furnaces might be the most efficient standard furnaces available, even if not quite as efficient as gasification boilers. One of the advantages of a standard furnace is that it requires far less maintenance than a gasifier. Standard furnaces generally cost less too. There is much more information on the differences between standard and gasification boilers in that section of our Buyers Guide. Domestic water is a term used for the water in your home’s plumbing system. Most outdoor boilers are used to heat domestic hot water. The most common method is to use a plate-type heat exchanger at the water heater. However, Heatmor offers a unique alternative, the domestic coil. It is an option, so your furnace must be ordered to accommodate it. The coil is secured into a water-tight hole created in the water jacket. Heat transfers through the coil directly into your home’s hot water supply. There are various ways this can be plumbed. You’ll find a color that will closely match your home, garage or outbuilding – or just one that pleases your eye. See them all here. There are no distributors in Florida, Louisiana or Hawaii. The map located here is clickable, so you can find a dealer in your area. This table summarizes the two Heatmor X Series wood boilers with their specs and features. Firebox Size 14 cu. ft. 21 cu. ft.
* Heating area: The two figures represent whether the furnace is filled once or twice per day. 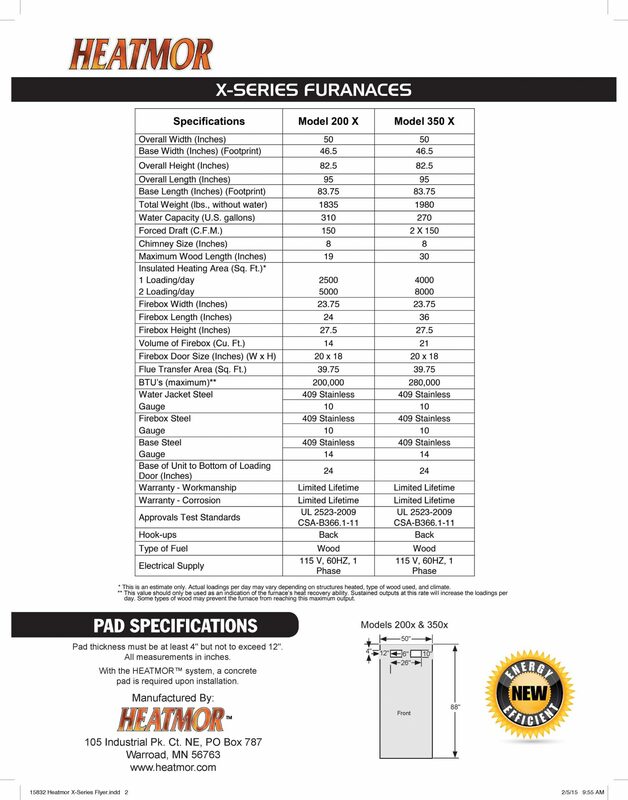 A full set of dimensions including door opening can be found on this spec sheet from Heatmor. As noted, the X-Series is currently the only EPA-approved wood furnace made by Heatmor. However, the brand makes additional lines. Residential Coal Burners (that also burn wood): The CB line includes the 100 CB, 200 CB and 400 CB with capacities to heat from 3,000 to 10,000 square feet. The problem with burning coal is finding affordable bulk coal if you don’t live where coal is mined. Burning wood in a coal burner is generally prohibited by law, though some states like Michigan have created loopholes that allow it. Dual Fuel: The200 CB and 400 CB Series units can be fitted with a Kagi 250,000 BTU waste/used oil burner. The advantage is that if the coal or wood is used up and not restocked, the oil burner will turn on. This gives you the freedom to be away from home for more than just a day or two. Commercial Furnaces: Three commercial models are the 450 CX, 600 CCS and 800 CCS. They heat 13K/18K/25K square feet respectively. 7-gauge stainless steel is used in the two larger models. The other has the 10-gauge stainless. Furnace prices vary by dealer. The cost of living in your area might affect pricing too. Installation cost varies widely based on how far the water lines travel, how easily the home’s exterior is accessed and what indoor equipment is used. Indoor equipment might be a single plate exchanger for a boiler system or as complex as a plate exchanger for hot water, water-to-air exchanger for a forced air system and a manifold with multiple lines in and out. EPA-approved outdoor wood boilers are considered high-efficiency units that use renewable resources. As a result, some cost rebates are available from some states and organizations. For example, Efficiency Maine is currently offering a $500 rebate on installation. Search for rebates at DsireUSA.org or by contacting your state’s Energy Office. Definitely look for rebates in your state. Next, get estimates from several wood stove dealers in your area. If you’re sold on one particular brand, your options for dealers might be limited. This is especially true where wood stoves aren’t popular. You might think a lack of competition drives up costs. But remember that wood furnace dealers aren’t just competing with other wood furnace sellers. They’re competing with dealers that sell conventional heat equipment such as furnaces and heat pumps. Once you’ve found an experienced installer with a proven record and good reputation, you might be able to negotiate a lower cost by doing some of the work yourself. Dig out and pour the concrete pad: Pads should be 4” to 12” thick for Heatmor X Series furnaces. While the pad must be level, it doesn’t have to be a pristine as professionally finished flatwork. Just be sure it is the proper size. Dig the trench: The water lines will be buried in a trench dug below the frost line. It’s hard work, but if you’re physically able, it will save you money. There’s a joke in the wood furnace industry that wood heats you twice – once when you cut/stack/load it and once when it burns. Doing some digging will have you warmed up even before your furnace is installed. If you purchase a wood boiler, share with us your cost for the unit and installation and what your initial impressions are of the system. If you have a Heatmor or other brand, we’d value your opinion too. We’ll pass on your prices and review for the benefit of other readers!